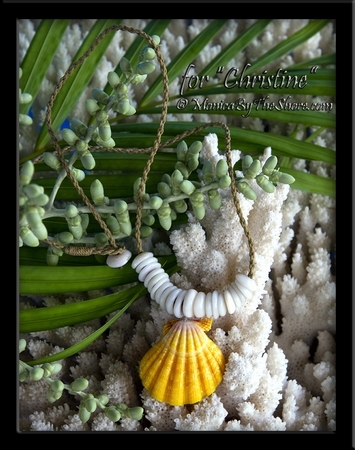 Custom "made to order" Hawaiian Sunrise Shell and North Shore Puka Shells twisted cord necklace. Brilliant Sunrise Shell in your color choice, with chunky Puka Shells found on the beach after being washed up by the North Shore waves. With natural style Puka Shell and loop closure, the necklace can be made up to 24 inches in length for the larger sized man or as short as you want for the most petite lady. North Shore local style with of plenty Aloha! Email me at MonicaByTheShore@live.com to tell me what you'd like and request a quote on price and delivery time. 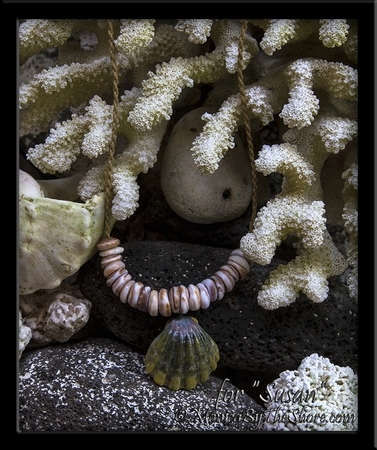 ** Pictured here are two different shell necklaces! A MonicaByTheShore original Sunrise Shell jewelry design, hand crafted one piece at a time on the North Shore in Haleiwa, Hawaii. Wearable Aloha made of rare seashells from Hawaii!